Two weeks into the inaugural Alliance of American Football (AAF) season, we've seen some highlight-reel plays and competitive games from this newly-formed league. There are rumors that the AAF is lying about its attendance numbers, but if you're a football fan, you'll still want to take a peek at the AAF's Power Rankings for Week 3. There has been nothing legendary about Atlanta's performance through two weeks of AAF play. The Legends have allowed the most points (64) in the league thus far and sit in the cellar through two weeks. It's not as bad as the situation in Atlanta, but Salt Lake is already down to its third-string quarterback heading into its third game. Despite playing well in their season opener, the Stallions now sit at 0-2 with a huge uphill battle ahead. You know you're already up against it when Christian Hackenberg is your starting quarterback. The Express did look a bit more competent in their second game, but it's easy to see why Hackenberg wasn't getting any snaps during his NFL tenure – through two weeks, he is averaging the fewest passing yards of any starting AAF QB. Led by former NFL offensive guru Mike Martz, the Fleet have some potential. San Diego failed to score a touchdown in its first 111 minutes of existence, but added two touchdowns late in a Week 2 win over Atlanta. The Achilles heel for San Diego will be its offensive line, which almost got quarterback Mike Bercovici killed in the season opener. Despite losing a tough game in Week 2 to Orlando, this San Antonio team is certainly one that we need to keep an eye on. The Commanders are loaded with talent on offense with quarterback Logan Woodside tossing the ball to his favorite receiver, Greg Ward Jr. Not to mention, their rushing attack is led by former collegiate standouts Kenneth Farrow, Aaron Green and David Cobb. It's also worth noting, the Commanders have 10 sacks through the first two games. Quite the accomplishment, considering AAF teams are only allowed to rush five defenders (maximum) on each play. The Iron have a solid quarterback in Luis Perez, who has proven to be a manipulative game-manager, but it's not like these guys have been a high-scoring unit. The true strength of Birmingham lies within its defense, which has allowed just nine points total through the first two games. This is also the AAF franchise that houses former NFL first-round pick Trent Richardson, and although he already has three touchdowns, he only has 99 rushing yards on 42 carries. Arizona hit a bit of a snag in its Week 2 win over a desperate Memphis team, but did ultimately orchestrate a come-from-behind win. Quarterback John Wolford can certainly take the Hotshots places this season, so look for him to continue developing a strong bond with former NFL receiver Rashad Ross, who has three touchdowns through two games. Tough to throw a better pass than this one. 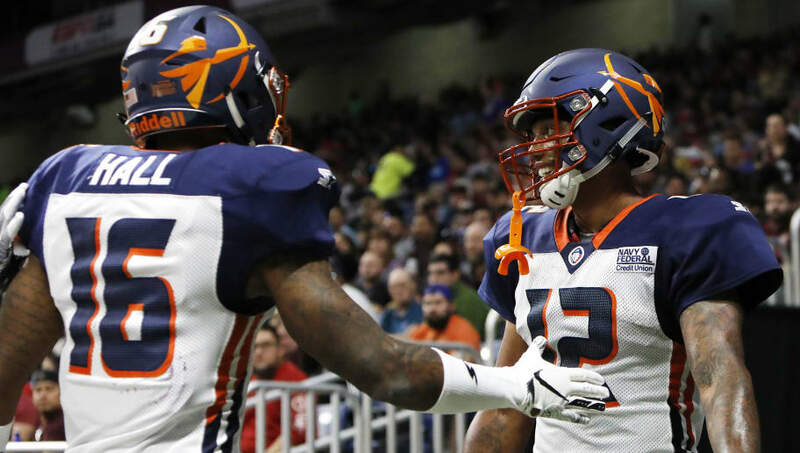 Led by the Ol' Ball Coach, Steve Spurrier, the Apollos' offense clearly looks more dynamic than any other team in the AAF. Quarterback Garrett Gilbert threw for a league-record 393 yards in a Week 2 victory over San Antonio, and performances like that will likely continue if receivers Charles Johnson and Jalin Marshall keep playing at the top of their game.